Stanley Trezevant had an idea. He was a developer, a real estate investor - a "mover and shaker" in the Memphis economy. He wanted to build a mall. A BIG mall. "No one succeeds on their own" - was a motto of sorts for his business dealings, so he went looking for a partner, which he found in long time friend James Bridger. Even with a partner, the scope of his mall dream was off the scale. Memphis had malls already: Southland Mall and Raleigh Springs Mall. Hickory Ridge Mall was on the way too and would be completed and open before the Mall of Memphis. None of these malls were regional malls though, the Mall of Memphis would be a travel destination. This was a time when home mortgage interest rates were 16.6%. After a site was selected and purchased (another interesting story) it was determined that the site was below the 100 year flood plain and had to be raised several feet. It took 3 years of dredging Nonconnah Creek for fill material to raise the Mall site to an elevation safe from flood waters. Nonconnah Creek runs along the edge of the former mall property, between the mall and the interstate. It proved quite useful to the mall project as every winter the high water levels of the creek brought in more silt to replace material that had been dredged. Both the mall and the nearby new car dealership benefitted from the free borrow material. But in the business world, time is money. Even with the combined resources of Trezevant and Bridger, the regular interest only payments on the construction loan were a burden. True to his motto of "No one succeeds on their own", the partners approached Ernie Hahn, a well known, successful mall developer from California with an offer. Pay the interest on the construction loan and in return receive 50% ownership in the mall. Mr. Hahn agreed and the deal was done. Another step closer to success. According to Mr. Trezevant, Mr. Hahn easily earned his ownership by paying the note each month for several years. Ernie Hahn, no doubt, was a integral part of the development of many, many malls throughout the nation. He was very successful in doing so, even if some malls didn't survive the years, like the Mall of Memphis. Although he didn't attend college or a military university, he managed to serve for the country in the United States Navy in his earlier years and provide tons and tons of people with great places to go for shopping, meals, and just plain old fun. 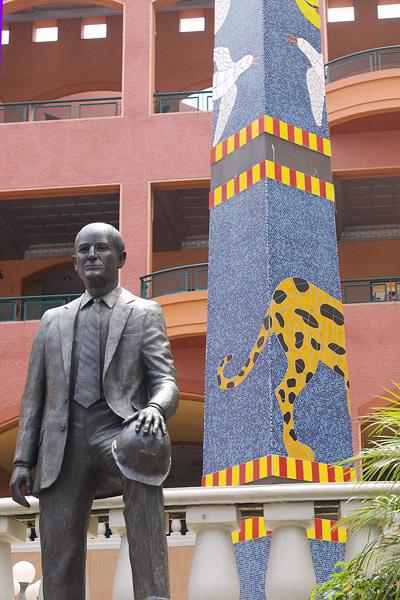 The statue honoring Ernest W. Hahn is located in Horton Plaza, a mall Hahn was associated with in California. 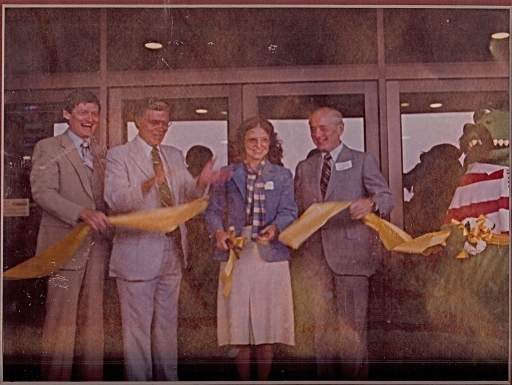 Ernie Hahn, far right, at Mall of Memphis Grand Opening.